The other day I discovered Amazon’s Matchmaker. It tells you which of the ebooks you own have audible companions and what the price is. I’d known you could get audible versions of your kindle books at a discount, but I’d not found any convenient way to see which books were being offered. It was exciting to come across the solution and I went through my list and purchased several inexpensive Audible books. I wish I didn’t have to aim for the inexpensive ones. I just read a blog post by Nora Roberts, in which she talks about readers who demand cheap books and how that devalues the work authors put in (among other things). Now, she was talking about people who take advantage and harass authors, not readers who look for a sale. But either way, my book budget is what it is and, while I utilize my library and buy books where I can (so authors do get some profit), I definitely don’t buy many at full price, utilize the free lists and keep an eagle eye on the sales. I feel guilty about it sometimes. Outside of price, a side bonus of getting audio copies of ebooks I already have is that it’s also a great way to chip away at my very long TBR list. This year is turning into the year of the audiobook. I’ve listened to far more than I’ve physically read. This lets me listen to them without adding a new book to the list. It’s just a great solution for me. So, onward and upward. 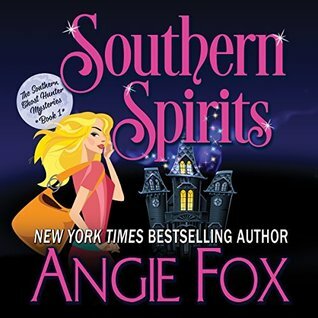 The first of the Audible book buying binge books I listened to was Southern Spirits, by Angie Fox. I initially picked this ebook up as a freebie in 2016. I’m pretty sure it’s perm-free. Shallow, but a perfectly passable bit of fluff. It was readable, entertaining and I liked the main character just fine. I did have a bit of trouble believing she’d have taken all the blame and financial penalty of calling off the wedding and not told anyone the horrible things her ex did. And the fact that the new love interest was so involved with the ex’s family really marred it for me. How would that work? Really? And it’s worth noting that the blurb calls hims “the town’s bad boy,” but he’s an ex-Marine cop. About as far from bad as you can get in a cozy, paranormal mystery. All in all however, I’d read more by Fox and Tavia Gilbert did a fine job with the narration. 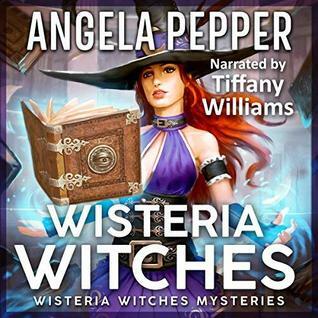 This entry was posted in books/book review and tagged audio book, book review, cozy mystery, cozy paranormal mystery, ghosts on March 7, 2019 by Zarah Robinson. I’m on vacation this week, so my posts might not be regular. But I read a book and a half on the way here and I have internet connection at the moment, so, I’m taking advantage of it and posting a quick review or two. I won a copy of Mindy Klasky‘s The Library, The Witch, and the Warder (Washington Warders) (Volume 1) through LibraryThing. This was fluff, but enjoyable fluff. Don’t go in expecting anything heavy or substantial, but just float along for the ride. Klasky has a fun writing style and I found myself liking all the characters. Though I did find some of it cheesy and cliche (the black cat familiar named Neko, the pocket protector/smudged glasses/bad fashion sense/pudgy antagonist), though I think some of that might have been purposeful on Klasky’s part, playing with tropes. This is labeled a cozy mystery, but with it’s magic element I think it’s a sort of urban fantasy, though not gritty enough to actually carry the title. For those looking for urban fantasy bordering on paranormal romance, look elsewhere. 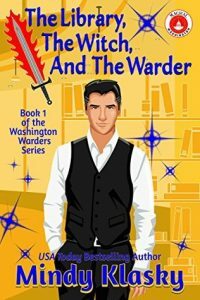 A warder and his witch is a platonic relationship, so no romance here (maybe later in the series going by the clues dropped, but not in this book). But I didn’t feel denied. I like the way things turned out. Lastly, this is apparently the flip perspective of Girl’s Guide to Witchcraft. Meaning it’s the same story from the male lead’s perspective, while GGtW is from the female lead’s perspective. This is normally something I dislike. Who wants to read the same story twice? But in this case I can see how it might work. Jane’s situation is only a small part of what David has going on in this book. Honestly, if a quarter of the plot focuses on her I’d be surprised. So, there is plenty the reader doesn’t see of Jane. I actually have GGtW. I think I picked it up as a freebie. So, if I ever get around to reading it, I’ll update this review. But in the mean time I don’t think the two would feel too redundant and The Library, the Witch, and the Warder doesn’t make me want to avoid it. This entry was posted in books/book review and tagged book review, cozy mystery, fantasy, magic, urban fantasy on June 6, 2018 by Sadie.